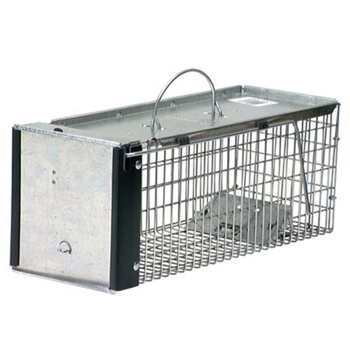 One Door Chipmunk And Squirrel Trap is ideal for trapping chipmunks, squirrels, flying squirrels, weasels and rats. The patented design that assures quick, safe catches and releases. The mesh openings on this trap are smaller than competing traps of comparable size to prevent escapes and stolen bait. Its patented design consists of a gravity action door and sensitive trigger to ensure quick, secure captures that target the specific animal size, eliminating undesired catches. Solid door and handle guard protect the user during transportation, while smoothed internal edges protect and prevent injuries to animals.